Understanding the different delegaciones that make up Mexico City will help you plan a smooth trip. The Mexico City metropolitan area is one of the world's largest and knowing where the popular attractions are is essential to pick a good place to stay. Also, Mexico City has the largest city by population in North America, with an estimated 26 million people living in the metropolitan area. So yeah, it gets crowded. This is where the city began… aka the historic city center. The colonial and European architecture combined with the narrow cobblestone streets distinguish the Centro district from the rest of Mexico City. It has an enormous amount of stores, street vendors, and is usually very crowded. Without a doubt, this area is one of the most popular areas in Mexico City and you definitely will visit it at some point in your trip. Plaza de la Constitucion is one of the largest squares in the world. It is surrounded by the Metropolitan Cathedral, the National Palace, as well as a number of other historic buildings. A huge Mexican flag is at the center. At 6 pm each day there is a ceremony while it is lowered and re-raised. Many different events are celebrated here so expect crowds throughout the year. It is considered to be one of the best examples of Mexican Art Deco architecture. The interior features include its copper cupolas and a Tiffany stained-glass stage curtain designed by Mexican painter Gerardo Murillo. You can enter the lobby for free. To visit the mezzanine with murals and galleries the cost is M$60. You'll have to pay an additional $M30 for a photography permit. If you visit on Sunday the entire building is free. The best place to photograph, and take an amazing Instagram picture, of Bellas Artes is from the cafe across the street. Finca Don Porfirio is located on the top floor and you'll have to buy a drink to gain access to the balcony. 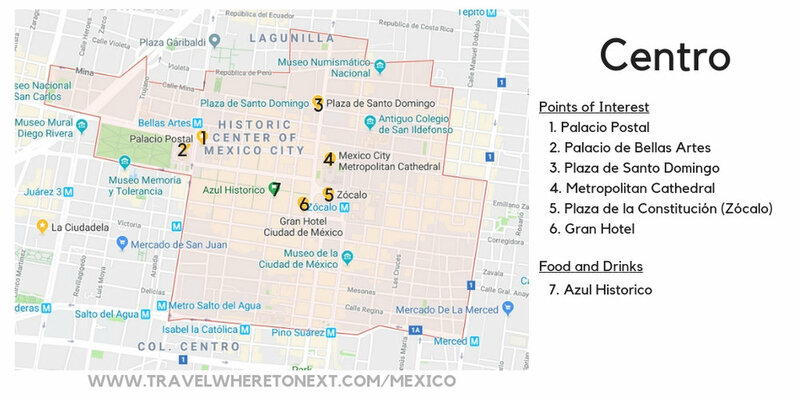 The cafe can be a bit tricky to find, so here are full directions: Directly across the street from Palacio de Bellas Artes is an entrance to the Sears building, or what looks like a mall. Walk inside and continue directly to the back wall where you will find an elevator bank. Take the elevator to floor 8 and you’ll find a small cafe in the corner that looks standalone. Once you order a drink you will gain access to the long narrow balcony that overlooks the Palace. The coffee is amazing (and cheap) and the view is definitely worth it. Located in Centro, the Torre Latinoamerica was once Mexico City’s tallest building. This skyscraper boasts a 360-degree observation deck that offers majestic views of the city and surrounding mountains. Pick a clear day and ride the elevator up to the top. The wristband you receive on entry is good all day. I suggest taking in the views both during the day and at night. The second largest square in Centro Histórico after the Zócalo. It is surrounded by important and impressive buildings such as the Palacio de la Inquisición, Santo Domingo convent and the old Customs House. Azul Historico is located inside the Downtown México hotel. Not only is the food delicious but the spacious courtyard is magical to eat in. The decor changes regularly so you never know what it’s going to look like, but rest assured it will be a beautiful setting for lunch of dinner. Make sure to try the tortilla soup which comes in the most adorable bowl I’ve ever seen! A colonial town that is now the center for counter-culture, art, students, and intellectuals. Coyoacán is where Frida Kahlo and Diego Rivera lived, a few blocks away from Leon Trotsky. Both of their houses are museums now. You'll find a tranquil residential area, filled with parks, squares, and cobblestone streets. It is now a favorite spot for the bohemian or hipsters. Closed Mondays. Tuesday 10:00-17:45. Wednesday 11:00-17:45. Thursday through Sunday 10:00-17:45. Also known as La Casa Azul, for the bright indigo blue painted walls. Frida Kahlo spent the last years of her life here. Admission includes access to the courtyard, a small series of galleries, and a portion of the house which has been preserved from the days when Kahlo was alive. The lines to get in can be ridiculously long - plan accordingly. The Mercado Artesanal is a two story craft market with vendors selling shoes, artwork, jewelry, and more. Right next door you’ll find the Bazar Artesanal, a smaller market with higher end jewelry. Right in the heart of Coyoacán is a gorgeous restaurant that has some of the best Mexican food the city has to offer. Mexico City can sometime feel like a concrete jungle with perpetually clogged highways and endless urban sprawl. That is why a visit to Bosque de Chapultepec should be on every traveler’s list. Not only is it one of the biggest urban parks in the world it was also once used as a refuge for the Aztecs before becoming a summer residence for their nobles. Map of the largest park in Mexico City - Bosque de Chapultepec. Click here for a larger (and downloadable) map. Lomas de Chapultepec is the wealthiest district in the city and is filled with walled off mansions. Mostly known to tourists as the Reforma district because of the street Paseo de la Reforma Avenue. Inside the district are important businesses and various entertainment. It is widely known to be the gay center of town. Don’t miss visiting El Moro Churerría in the Roma District. This small chain has a couple of locations in Mexico city and they all make the most delicious churros and churro sandwiches. But, this specific location has the cutest setting with the whitest tiles. Trendy and gentrified area. You'll find cobblestone streets, upscale boutiques, and many restaurants. It is a wealthy residential area as well, and known for its arts market. Plaza San Jacinto is the heart of San Ángel and the square has both outstanding beauty and a bloody history. Hangings of Irish deserters who abandoned the American troupes and sided with the Mexicans in the Mexican-American war took place here. Currently, the square is home to the Bazaar Sábado (more on that below), excellent restaurants and many beautiful and historical buildings. You could spend your whole Saturday at El Bazaar del Sábado. This lively market in San Angel has some of the best handicrafts of the highest quality from all over Mexico. You’ll find fine jewelry and textiles as well as woodwork and ceramics. Shopping also comes with a show, live performers often make appearances. If you have the time be sure to visit the district of Xochimilco. This area is called Mexican Venice for its series of Aztec irrigation canals, and these canals are all that remain of the ancient Xochimilco lake. Because of its historical and cultural significance, Xochimilco was designated a UNESCO World Heritage Site in 1987. One of the most popular things to do in Xochimilco is take a canal ride on one of the colorful gondola-like boats known as trajineras. These boats can be hired for a leisurely float down the canals with a group of your friends. Along the way, you’ll pass vendors selling food, beer, and other drinks. Modern redeveloped business district at the cities western tip that consists mainly of high rise buildings, surrounding a large shopping mall. High class residential, business and shopping area in the south-central city. Tlalpan is home of the Ajusco, a volcanic mountain peak and National Park, the highest mountain inside Mexico City proper. A wealthy residential area in Mission (colonial) style containing expensive designer boutique stores in the city. You'll also find embassies here and upscale restaurants. There are many night clubs and hotels to choose from as well.